ON MY MUST DO LIST for this school year! 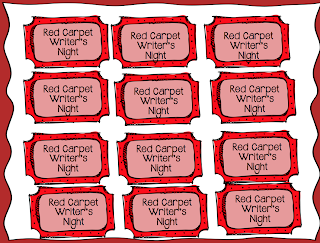 I've designed a Red Carpet Writer's Night Hollywood Theme packet. I'm super excited. Here are my plans. Parents, students and staff are dressed in formal or semi-formal attire. They arrive and have pictures made and refreshments. Students have the opportunity to read their masterpieces to the class. Check out the list below of items included. 1. Welcome sign for all the classroom doors. 2. About page including instructions on how to plan a successful night. 9. Backdrop for pictures (so cute) This is projected on a wall or screen and parents and students stand in front of it for their picture to be taken. This will be an exciting event. It is guaranteed a success. What a great way to get students excited about writing. For the past couple of years we have seen a need to focus our attention on writing. Since I'm the principal of second, third and fourth grade, this is a great opportunity to focus on writing. 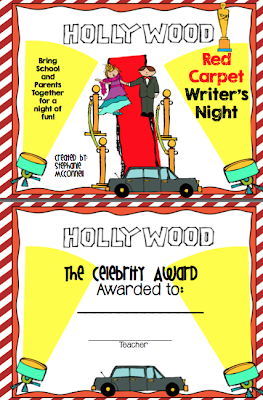 The Hollywood Theme is bound to be a success and loved by all students and parents. I can't wait to see everyone all dressed and smiling for pictures. Now all I have to do is plan the day and print the tickets-Oh and get a photographer. Don't forget to follow me so you can keep up to date on the next project!